Atwater Market is a market hall located in the Saint-Henri area of Montreal, Quebec, Canada. It opened in 1933. The interior market is home to many butchers and the Première Moisson bakery and restaurant. The outside market has many farmers stalls which sell both local and imported produce, as well as two cheese stores, a wine store specialising in locally produced spirits and a fish store. Quality is usually very good, although bargains are quite rare. 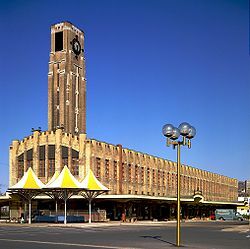 The market's Art Deco building was designed by architect Ludger Lemieux, working with his son, Paul Lemieux. It is located on Atwater Street, near the Lachine Canal and the Lionel-Groulx Metro station, as well as Greene Avenue. A pedestrian bridge, which can also be used by bicycles, connects the market to Saint-Patrick Street and to a bicycle path in Pointe-Saint-Charles on the other side of the Lachine Canal. The presence of this bridge explains the popularity of this market with bike riders, who often stop there, and greatly contributes to the great summer ambiance of the area. The bike path travels from the Old Port of Montreal to the Lachine Marina and is owned and maintained by Parks Canada. The area immediately east and west of the market has enjoyed a rebirth and gentrification, with a great deal of upscale condominiums being built right on the Lachine Canal and replacing low and modest cost housing. Since the Lachine Canal reopened in 2002, residential property values in the Southwest borough have shot up by 61 per cent, according to Montreal's 2006 property valuation roll, with the highest growth happening around the Atwater Market. Atwater Market takes its name from the adjacent Atwater Street. Atwater Street was named, in 1871, after Edwin Atwater (1808–1874), a municipal alderman of the district of Saint-Antoine. ^ "Montreal Insites". Heritage Montreal. Retrieved 2009-11-15. This page was last edited on 11 January 2019, at 18:42 (UTC).